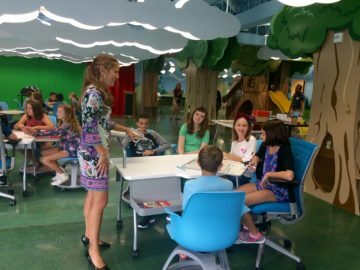 Students at Haine Elementary/Middle School using the new CIRC space. Dr. McCarty joined Superintendent of Schools Dr. Tracy Vitale, students, staff, parents, community leaders and Inventionland executives at a recent ribbon cutting to celebrate all that the space has to offer for the nearly 1,400 students. Future CIRC space installations are planned at each of the district’s other three K-6 building sites over the next several years. In one area, you can find students taking part in a demo on the many applications of a laser printer, from cutting fabric to creating food art to designing plastic. Just across the room, first graders may be working on puzzles while sixth graders are seen trying out the green screen technology and fourth graders are brainstorming story topics. Now and in the future, students will collaborate with peers on coding, robotics, engineering, communications and graphics design. They also experience self-discovery, learn problem-solving skills and take home real-world knowledge.